Explain Fiber optic communication system. Like traditional metallic wire communication system, the fibre optic communication system also transmits various types of information from source to destination. 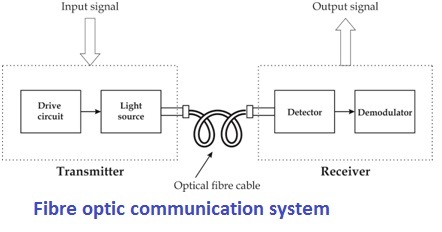 The reason to use optical fiber in place of metallic wires in communication system is that they are cost effective, lightweight and they can carry greater data at a very high speed with low signal distortion. The Fig. shows the block diagram of a general fiber optic communication system. It consists of a light source with supporting electronic circuit (a power supply). First, the input data, which has to be transmitting through the fibre, is converted into the analog or digital electrical signal with the help of a transducer  . These electrical signals drive the power supply of a light source which converts these signals into a corresponding optical signal. Generally, a semiconductor laser or a light emitting diode is used as a light source. The common wavelengths emitted by light source are 850 nm, 1300 nm and 1500 nm. A transducer is an electronic device that converts energy from one form to another. e.g. microphones, loudspeakers, and antenna etc. The optical fibre cable is consisting of a bundle of long optical fibres. The light signals emitted by light source are launched into optical fibre cable with the help of optical fibre connectors. The optical fibres transmit the light signal from source to destination. For long distance transmission, two or more optical fibre cables are joined together with the help of splices. To couple one optical fibre with two or more fibres we use optical fibre coupler. In long-distance communication systems, the light signals get attenuated and distorted due to various reasons. Thus, to compensate for the signal loss over the long run of the fiber, repeaters and regenerators are used at several positions of the fibre. The detector receive light signals from the other end of the fibre, with the help of a connector and converts these signals back to an electrical signal, which is a copy of the original electrical input. The support electronics will process that signal to perform its intended communications function.